Two more clips from Ron Edge’s collection. 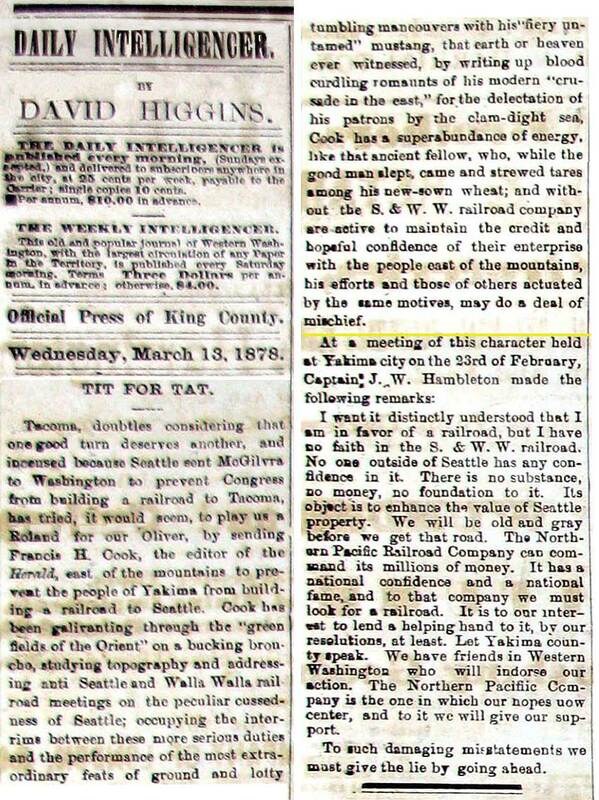 These are from the Daily Intelligencer in 1878, and are meant to be read (and explained) in the context of the history of the Seattle Waterfront and a Chapter 3 posting of that, which will soon follow this posting. The subject of Chapter Three is early railroad history as it related to Seattle’s efforts to compete with Tacoma and build its own line to the East, or at first to Walla Walla. That Whitman County center for agriculture and mining was then the largest city in the territory (and would stay so until 1881 when Seattle slightly surpassed it.) Seattle named its railroad the Seattle and Walla Walla.